An Independent Man: John WILKINSON, Jr. I can think of a number of independent individuals in my family, all living, and all women--people I truly admire. So I got to thinking, "Were there any men in the family that could have been described as independent or a free spirit?" Well, I don't know for certain, but I think that John WILKINSON, Jr. might have fit the bill. Here's an opportunity for me to highlight another single person in my family tree; too often, it's the direct ancestors, or the relatives who married and had children that get featured in family stories. But those single men and women have their place, too, and contribute to our family histories in diverse, and often profound ways. They often had more freedom to travel, pick up and settle multiple times, and try new experiences than those who had families to support. The history of John WILKINSON, Jr. begins on 25 March 1879 in what was then Northumberland Co., Ontario, Canada, probably in or near the unincorporated community of South Monaghan, situated halfway between the cities Peterborough and Port Hope in present-day Durham County. He was the fourth of seven children born to John WILKINSON, Sr., a carpenter, and Mahala SAYERS, and the last of their children to be born in Canada before they immigrated to Muskegon County, Michigan in late 1880, successfully avoiding both the 1880 U.S. Federal Census and the 1881 Canadian Census! There may have been something in John's upbringing that caused him to be independent. His siblings, for the most part, all seemed to be a bit unusual. His oldest sibling, Mary J. WILKINSON, my great-grandmother, seems to have been the most traditional, marrying her husband and having 13 children, a not-so-surprising number in those days. Then came Manley, who married a German immigrant and had 11 children. Not one of those offspring married, except for the youngest, Alvin; and he waited until both his parents were deceased! What was the deal behind that? Next came William James, who moved out west to Washington State for a while. The family history always showed him as single, but I found him in a census with a wife and several children. However, he returned to Michigan to live with his sister until his death. No spouse or children were listed in his obituary. Did he divorce? Catherine seemed fairly typical, but like her brother Manley, married an immigrant from another country (Sweden). She outlived him to marry again. After John came Frederick, who married a woman with a similar name, Fredericka. They moved to Washington State, like William, and lived for quite some time in the community of Freeland, which was started as a utopia for those with socialist sympathies. Ella contributed to the ethnic diversity of the family by marrying an Italian street vendor. And poor little Jennie died young. We know that John migrated around quite a bit. He homesteaded in the Peace River area near Ft. St. Johns, British Columbia, although my attempts to locate his land have been futile, John Wilkinson being a fairly common name. He also lived in Monroe, Snohomish Co., Washington for a while, with a SAYERS cousin, relatives on his mother's side. I had an opportunity to meet the daughter of this cousin when she was elderly, and she told how she, her siblings, and her cousins loved Cousin John: how they would get into water fights with him when fetching water from the well! My paternal grandfather, a grandnephew of John also had fond stories to tell about how he used to play with the youngsters in the family. He may not have had children of his own, but John apparently loved and was beloved by the little ones in his extended family! While in Washington State, John enlisted with Co. C. of the 35th Regiment of the U.S. Volunteer Infantry to serve during the Philippine Insurrection, which occurred at the end of the Spanish-American War. Did he become naturalized as part of his enlistment? I don't know. I do think it fits his independent personality that he did not serve in a well-known war, but served in a smaller military venture, instead. When he returned to Michigan, there was no local military fraternal organization specifically for that operation, so he joined the Guy V. Henry Post, Camp 3 of the United Spanish War Veterans in Grand Rapids, Michigan. During the Depression, he worked as a teamster, and owned a farm in Paris Twp., Kent Co., Michigan, which was worth $9,000--a tidy sum in those days! Paris Township was nowhere near any of his siblings, so unlike many single men of his day, he did not live with a sibling or elderly parents. In the 1940s, he lived in Rothbury, Oceana Co., Michigan, another community away from his siblings. However, he is mentioned in his siblings' obituaries as a survivor, suggesting that although they may have lived apart, there were still good relations between them. These many locations show a man on the move, but a prosperous and apparently happy one. At this time, I do not know his death location, but he died 6 August 1955 and was buried in the Wilkinson family plot in Oakhurst Cemetery, Whitehall Twp., Muskegon Co., Michigan. Source: Tombstone of John Wilkinson, Jr. Oakhurst Cemetery, Whitehall Twp., Muskegon Co., Michigan. Digital photograph taken at the request of Miriam Robbins Midkiff by Random Acts of Genealogical Kindness volunteer Toni Falcom. Digital copy in the possession of Miriam Robbins Midkiff, Spokane, Washington. 2002. What do you think? Was John WILKINSON, Jr. an independent, free spirit? I am certain of it! A couple of weeks ago, when my Internet service was out, I received a large envelope in the mail from my maternal uncle. In it were several news clippings: one from the 1950s about the house he, my aunt, and my mother had lived in with their parents which had been purchased by the government and then moved to make room for an interstate coming through the city of Grand Rapids, Michigan. The article showed 505 Shamrock along with neighboring homes up on trailers being ready to be transported to their new locations. The other article is more recent. It features my cousin, Mark, and his wife Annette, and the alternative ministry they operate out of an alcohol-free nightclub (more photos are here). I get The Grand Rapids Press news feeds in my Google Reader, but they pile up fast (30 to 40 a day! ), so occasionally I dump them out without reading. Apparently, I missed this when it showed up in April. I'll be saving this clipping in our family scrapbook for future generations. It's part of our family history. Elyse is a 19-year-old young woman who has made 15 how-to genealogy videos and posted them at YouTube. She seems like a typical teenager: she has a boyfriend, enjoys Harry Potter, and obviously loves being on the computer! Wouldn't it be great if Elyse were a part of your genealogical society? If you have young people in your family that you think would be interested in genealogy, you may wish to introduce them to Elyse's videos. And we not-so-young people can benefit from her "vlogs" (video logs), too! What a difference it has made this year for all of us not being able to attend the Jamboree by having a large number of genea-bloggers in attendance! Have you been tracking the goings-on like I have? I've been following Randy, Craig, Elizabeth, and now Dean as they either live-blog or blog shortly after each segment. With photos and summaries, it's not hard to imagine myself there, enjoying the conference. Maybe next year...! I'm honored to be featured as the guest blogger at footnoteMaven's Shades of the Departed blog this morning. This photography-themed genealogy blog has been a big hit in the genea-blogging world and rightly so. fM brings her expertise as a collector of old photographs, researcher of long-departed professional photographers, and detail for source citations (hence the moniker "footnoteMaven") to this medium. Every Friday, she features a guest post from a genea-blogger sharing some aspect of photography as it relates to genealogy in the column "Friday from the Collectors." At the 2007 Spring Seminar presented by the Eastern Washington Genealogical Society in Spokane, Washington, I was privileged to meet the Maven face to face and look forward to future opportunities to visit again. Besides her Shades blog, fM has been blogging at her namesake main site for quite some time. She hosts the monthly "Smile for the Camera" Carnival, maintains at least three other genealogy, history, and/or writing blogs for local groups in Western Washington, and is very active in the Washington State Genealogical Society. I live in the Pacific Northwest and only four of all my hundreds of North American ancestors are buried west of the Mississippi River (one in San Antonio, Texas; one in St. Paul, Minnesota; and two in Oregon's Willamette Valley--eight hours away!). I've been blessed beyond measure by many wonderful volunteers who have taken the time to tromp through my ancestral cemeteries back East and willingly send me what is in many cases the only photographic evidence of my ancestors' lives. Very occasionally, however, a problem will occur. My post is a Miss Manners-style directive on how to address those sticky situations that can arise when you make a request of volunteer genealogy photographers to take pictures of your ancestors' tombstones. It can be found here. Did you know that at each of the 50 United States' official government websites there is at least one page of genealogical and historical resources (online and offline) for that particular state? AND did you know that there is a webpage that list links to all 50 of those sites' resource pages? Neither did I until today, thanks to Carlie, a local librarian and a participant in my current Basic Online Genealogy class I'm presenting this month at the local county library district. This is one you'll surely want to bookmark! Source: Robbins-Valk Wedding, Bride and Groom and Their Parents. Photograph. 25 Jun 1965. Original photograph in the possession of Miriam Robbins Midkiff, Spokane, Washington. 2008. Growing up--like most little girls, I suppose--I loved to look at my parents' photo album of their wedding. The big 8" x 10" black and white glossies made them look like the movie stars I was sure they were. In addition, there were photos of members of the wedding party--my beloved aunts and uncles whom I rarely saw--and individual shots of my parents with each set of their parents, my grandparents who were like celebrities when they visited us in Alaska from their homes in Michigan. But I never saw the photograph above until eight years ago, when I visited Michigan last and spent some time with my Grandmother DeVries, who had arranged for my husband, my children, and myself to take a memorable vacation that October. She handed me a miniature photo album filled with forty-four 3" x 4" shots, including the one above, which I had never seen before. It quickly became my favorite, showing my parents, my paternal grandparents, and both sets of my maternal grandparents (my mother's parents having divorced and remarried to other spouses). From left to right are my paternal grandparents, Robert Lewis ROBBINS (1920 - 2003) and Jeanne Marie HOLST (living; birth name, Jane Marie YORK); my parents, Bryan Henry ROBBINS and Faith Lillian VALK; my maternal grandmother and step-grandfather, Ruth Lillian HOEKSTRA (1919 - 2001) and Adrian DeVRIES (1916 - 2007); my maternal step-grandmother and grandfather, Elaine Estelle SEIF (living) and William VALK (1912 - 1989). This photograph was taken the evening of 25 June 1965 by Werkema Studio of Grand Rapids, Michigan, in the chapel of my parents' alma mater, Grand Rapids School of the Bible and Music (now a part of Cornerstone University), Crescent Street at Bostwick Avenue. Wordless Wednesday: Happy 43rd Anniversary, Mom and Dad! Whenever you do research for a certain location, it's vital that you understand how records were gathered, when record-keeping began, and where the records are now archived. Unless you know this, you will be stumped as to why your ancestors may be missing on key records, or where to find them. Although I had been extensively researching in Michigan vital, cemetery, and census records for over ten years, including using resources such as Ancestry's Red Book and FamilySearch's Research Guide for Michigan, it wasn't until I read this book that I began to comprehend why I was hitting brick walls. Using this resource has helped me find alternative records and discover more about my ancestry that I would not have otherwise been able to do. If you have ancestors from Michigan, you must have this book in your home library...AND it's on sale (26% off!) until 11:59 PM, EDT, Monday, June 30. Believe it or not, I'm not done with this series; I have two, maybe three, more soldiers to feature, as well as a post listing the resources I used for my series. I'm also hoping to create a slideshow of all these men (if I get on the ball, I might have it done by the Fourth). Source: Jackson, Merrick. "Out of the Attic." Potter-Leader Enterprise (Coudersport, Pennsylvania), undated clipping, c. 2000s. Original privately held by Joyce Jackson Bailey, address unknown. 2004. I've added this clipping to Merrick's biographical sketch. June 2008 Scanfest is Coming! Just a reminder that next Sunday, June 29th from 11 AM to 2 PM (Pacific Daylight Time) will be our next meeting of Scanfest. It's a time when family history lovers gather online to chat while scanning their precious family photos and documents. ...and our old modem was perfectly OK. Apparently moisture had gotten into our phone box, so the tech replaced the seal and also replaced our phone jack in the house with one with a filter. All is well! After spending over $100 in new modem and router equipment, my Internet service still is not working. My ISP insists that the connection is good. With heavy building construction across the street and the major street we live nearby being torn up literally on a nightly basis to lay new cable, I'm not convinced there's an exterior problem. A tech will arrive in the morning to hopefully resolve the issue. Meanwhile, we're making family history this week, as Randy likes to say. A grandniece was born a week ago. My sister graduated from nursing school on Monday. My maternal aunt from the Detroit visited for the graduation, and my sister-in-law and her husband will arrive tomorrow. Lastly, my daughter leaves for an 11-day mission to the Dream Center with her youth group on Saturday. It's probably better that I wasn't online during this busy week, anyway! Lastly, thanks to Becky, Randy, Tim, and Terry, I discovered that an interview I did last January for Google Book Search aired recently online. Because it took so long to air, I sort of figured by this time that Google decided to scrap the project. I am delighted to see that it survived the cutting floor and am very pleased with the results! Hopefully, it will inspire others to use Google Book Search in their genealogical research, too! Today is the first day of my Summer Break and I got up to discover my Internet is out. Crews have been working for a couple of weeks on the main street nearby, digging it up to lay new broadband cable. This may be affecting my service. We use a great little ISP that collaborates with our local phone company to provide Internet; the problem is, there's usually only one customer service tech on duty at a time. He must be busy, because he hadn't gotten called in response to my voice message by the time I left the house this afternoon to come here to the library with my laptop to check my e-mail. Sunday, the business is closed. So, it may be Monday or later before I have service. I have to say that with not having the distraction of the computer, my house got pretty clean this morning! Lillian Love was named for her paternal grandmother and her grandmother (Love is a family surname). New Online Edition of Everton’s Genealogical Helper will debut July 1! Subscribe today for only $10.00! LOGAN, Utah, June 12, 2008. Genealogy Online, Inc., publisher of Everton’s Genealogical Helper, today announced the publication of the Genealogical Helper in an Online Edition. The Online Edition is an identical copy of the 176-page paper edition – complete with hotlinks to the hundreds of website addresses found therein. Format & hosting – Everton’s Genealogical Helper, Online Edition, will be in .pdf format, readable by anyone, with any computer running an Adobe Acrobat Reader (Available at Adobe.com as a FREE download.) The Online Edition will be hosted by FamilyLink.com, Inc. Subscribe NOW at: http://www.everton.com or phone 800-443-6325. Genealogy Online, dba Everton Publishers, is the publisher of Everton’s Genealogical Helper, now in its 62nd year of helping genealogists find their ancestors. Genealogy Online, Inc. also publishes the Handybook for Genealogists, 11th edition, a top-selling guidebook for family historians. Their website is found at: http://www.everton.com. Also see: http//www.GenealogyBlog.com. Starting today, you can enjoy big-time savings on PARCEL POST shipping costs at www.genealogical.com. For the next seven days, you can order any quantity of books and/or CDs on our website www.genealogical.com and pay only one penny for PARCEL POST shipping. You can order as many times as you like before 11:59 PM EDT, Wednesday, June 18, 2008, and be charged just a penny for postage and handling on each order. This limited-time offer applies to every book and CD in our collection. For example, you can use the penny offer towards the 40%-and-more-off "Genealogy Warehouse" books on our site; Sharon Carmack's popular book, "You Can Write Your Family History"; either of our 4-CD bundles: "New England Genealogy Bundle" or "Virginia Genealogy Records Bundle"; or Elizabeth Shown Mills' definitive work on citing sources, "Evidence Explained: Citing Historical Sources from Artifacts to Cyberspace." You can have any of these products--or anything else on our site!--for just one cent more than the retail price. IMPORTANT EXCEPTION: This special offer applies only to PARCEL POST shipments within the U.S. All UPS, Federal Express, other USPS shipping methods (e.g., Priority Mail, Next-Day Mail), and International shipping will be charged our regular shipping and handling rates. It's been over a week since I've published a post that wasn't an announcement or news release of some kind. I apologize to my readers for the lack of content, but this is the last week of the 2007 - 2008 school year for my employer, Spokane Public Schools (and many grateful thanks to the State Legislature who forgave our week of snow days at the end of January - I can't imagine enduring yet another five days!). I've also started a new four-week online genealogy class for the Spokane County Library District this month. As both a school staff member and a parent, I'm pretty exhausted with end-of-school-year activities; I haven't even participated in the genealogy carnivals lately! Next week will be busy as well, as we have company coming at both ends of the week. The beginning of the week I have an aunt coming from the Detroit area to help us celebrate my younger sister's graduation from nursing school (we're so proud of her! ); and at the end of next week, my husband's sister and brother-in-law will be coming through on their road trip to see the great tourist places of the Old West. I plan on enjoying my time with family. Meanwhile, when I have a few moments to be online, I've been hunting for ancestors in the Michigan vital records newly featured on FamilySearch's pilot Record Search site. (Look for some posts in a few weeks on my comments and observations of these databases.) If I'm really tired, I'll go over to Facebook and play a game or two of Scramble to wind down before bed. Thanks for all those who've added me to their friend lists on Facebook. If you have an account, please look for me (Miriam Robbins Midkiff) to add to your friend list. Once I've caught up on my rest, I'll be resuming my participation in carnivals and features such as Wordless Wednesday, finishing various series I've started in the last year, and writing more journal prompts for my other blog, AnceStories 2: Stories of Me for My Descendants. I appreciate your patience and encourage my readers to visit the many fine blogs listed in the right-hand column, about half-way down the page, for fresh and new daily content. We sincerely apologize for this inconvenience. Due to an unforeseen circumstance, German Ancestry – Part of the Ethnic Ancestry Seminar Series, originally scheduled on June 10, 2008 has been rescheduled and will now take place on July 8, 2008 at 8:00pm EDT. There is no need to re-register for this new date and time. You will automatically be sent a reminder email 24 hours prior to the start of the event. If you are unable to attend the event on the new date, don’t worry! The webinar will be recorded and available for viewing shortly after the live event. You will be notified when this recording becomes available. Again, we sincerely apologize for the inconvenience of canceling the webinar on such short notice and look forward to presenting the German Ancestry topic on the new date. If you are interested in registering for this and other FREE ethnic webinars (Italian, Polish, Irish), go here. To view past webinars, including the English ethnic one, go here. The FamilySearch Record Search pilot has just added 3.1 million records from the 1850 U.S. Census for the states of Maine, New Jersey, and Ohio. An additional 117,000 unindexed digital images were added for Philadelphia marriages and Czech Republic church books. These collections can be searched for free at http://pilot.familysearch.org. Now you can hear about the best genealogy tools and tips by tuning into the free, monthly Family Tree Magazine Podcast. In this online radio show, host Lisa Louise Cooke—creator of the popular Genealogy Gems podcast—takes you behind the scenes to learn more about the topics covered in Family Tree Magazine. Each 30-minute episode features interviews with genealogy experts and Family Tree Magazine editors on using genealogy Web sites, records and resources. Plus, editor Allison Stacy gives you sneak previews on upcoming issues and managing editor Diane Haddad delivers the scoop on the latest genealogy news. You can listen whenever it’s convenient to you by visiting the FamilyTreeMagazine.com podcast page at http://www.familytreemagazine.com/podcast/. I heard about this new Family Tree Magazine podcast through Lisa Louise Cooke's podcast, Genealogy Gems, and since I'm a big fan of Lisa's podcasts AND a big fan of the magazine, I went and listened to the FTM podcast. It was well done, of course, and I look forward to many more in the future! What's a podcast? Remember how you loved to listen to your favorite radio show as a kid? Well, podcasts are like radio shows, only they are offered through the Internet. There are podcasts for nearly every subject under the sun, and you can use Google to find podcasts for history, quilting, gardening, or whatever your second-favorite hobby may be (genealogy being your number one favorite, of course!). By the way, you don't need an iPod or an MP3 player to listen to a podcast. All you need is a pair of speakers or headphones plugged into your computer and you can listen. If you have dial-up for your Internet connection, you probably will need to download the audio file to your computer first (instructions below), then listen to it with Windows Media Player, Quick Time, Real Player, or whatever you have on your computer, rather than listening to it straight off the Internet. There are many genealogy podcasts, and links to them can be found at Cyndi's List here. Instructions: I've found that using Firefox (my browser of choice) does not allow me to download the podcast easily. So I connect to the Internet using Internet Explorer and go to the podcast site. At the bottom of each of the site notes for each podcast is usually a link that says "download." Right-click and chose "Save Target." Decide where you want to download the file (I have created a podcast folder in "My Music"). After the file has downloaded, go to the file wherever you have stored it on your computer. Double-left-click on the podcast file for it to start playing. If you have a little trouble getting it going, or want to choose which player will play the file for you, right-click instead on the file and choose the player you prefer. "Using Podcasts to Further Your Genealogy" is on the list of computer classes we will be offering EWGS members in our new lineup for 2009 - 2010! Do you have German, Irish, Polish, or Italian ancestry? Ancestry.com is offering free online ethnic seminars (called webinars) online on Tuesday evenings this month and July 1st (5 PM Pacific Daylight Time). You do not need to have an Ancestry subscription to participate. You can go to this page to get more information and register for these classes. Links will be immediately e-mailed to you so that you can access the webinars on the days of their showings. You should click on one of the links ahead of time to test your computer's audio and video capabilities. I'm a little disappointed I didn't hear about this sooner, because I missed the English genealogy webinar that was broadcast June 3rd! If you live in the Spokane area, you may be interested in taking my FREE four-week Online Basic Genealogy class, offered through the North Spokane Branch of the Spokane County Library District. We will be meeting every Thursday evening for four weeks from June 5 through June 26. Class times are 6:30 - 8:30 PM. This four-week course will cover organizing your information, using home sources, interviewing relatives, researching vital and census records, and utilizing local resources. If you are interested, call the the library at (509) 893-8350 to register. Source: Marie Lewis and Girlfriends. Photograph. 1917. Original photograph in the possession of Joyce Robbins Sanders, San Antonio, Texas. 2008. It was Summer, 1917 in Muskegon County, Michigan. It could have been anywhere: Muskegon Lake, Bear Lake, Mona Lake, Wolf Lake, or Lake Michigan. Marie Lewis, my paternal great-grandmother, sits at the bottom of the photo, surrounded by her girlfriends. Some of the young ladies in this photo are dressed in swimsuits, others in summer dresses. 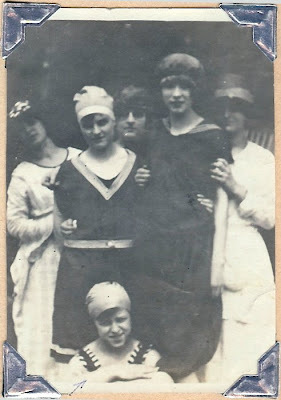 Although the photograph was labeled as to the date in my grandaunt's scrapbook, we don't know who the ladies are. None appear young enough to be Marie's younger sisters, Bonnie (age 10) or Bertha (age 6). One of them was probably Stella Bolthouse, Marie's friend and later a witness to her marriage to my great-grandfather, William Bryan Robbins. Marie, who would have been 15 at the time of this photograph, had not yet met Bryan by the summer of 1917. Her maternal grandfather, John Wilkinson, would pass away that September and during the funeral, Marie would meet Bryan while he was driving the hearse. They would correspond during Bryan's service during WWI, and marry Christmas Day 1919. But for now, Marie is still a single young woman, cooling off from a hot, humid Michigan day at a favorite lakeside with good friends. Written for the 49th Carnival of Genealogy. June 3 - 49th Edition of the Carnival of Genealogy - Swimsuit Edition! June 9 - 6th Edition of the Carnival of Irish Heritage and Culture - What Does Being Irish Mean to You? Bill Puller's recent podcast (Episode #11) has some good information on two online backup services, Mozy and Carbonite. Listen to this episode at his website, The Genealogy Tech Podcast. Go here to learn how to join our group of chatting, scanning family archivists, historians, and bloggers!